It's taken a while, but at last Harper's pretty happy with her life: she's making a living, using her unique talent to help people and she's got a boyfriend. Then her stepfather arrives on the scene, seeking forgiveness for his past sins - the abuse and the drug-use - and the police finally get a tip-off after all these years, that Harper's long lost sister has been spotted in a mall. With all this going on Harper realises life is getting a little complicated, but she doesn't expect those complications to include her stepbrother Tolliver getting shot, or watching a cop die taking a bullet for her. 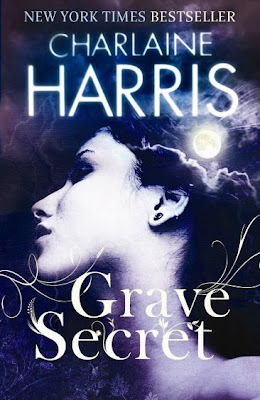 This is the fourth book in the Harper Connelly series by Charlaine Harris, and I was totally blown away by it. Seriously. When Harper and Tolliver go to a cemetery near Dallas for their latest case to help a woman from a very rich family find out how her grandfather died, Harper uncovers a few hidden secrets that someone desperately wants to keep buried. Badly enough to shoot at Harper. But the bullet misses her and instead hits Tolliver, and he ends up in the hospital. And if that's not bad enough, Tolliver's father is out of jail and has decided that now is the best time to reconnect with his children. Even if he doesn't seem to think too highly of Harper. Not to mention that people keep getting shot around Harper as she slowly uncovers small pieces of the Joyce mystery, with a little help from her psychic friend, Manfred. I was really glad to see that he keeps popping up in the series. He's a very interesting character. The familial entanglement of the wealthy Joyce family are darkly mirrored and even connected to Harper's. It seems that the longer she spends in Dallas, the more complicated things get. And the less tolerant people seem to be of her newfound relationship with Tolliver. Except for their mutual little sisters who seem excited at the prospect of a wedding. I absolutely loved this book and adore the series. I'm a huge Sookie Stackhouse fan and didn't think I would get this caught up in Harper's world, but I have. Every book gets better and deeper into the core of Harper's gift and circumstances. The heartbreak of her sister's disappearance has hounded her for years, and in this book it resurfaces in an unexpected way. As sad as it is, I'm glad that Harper is finally able to find some closure in this department. Grave Secret is an amazing addition to this wonderful series and only deepened my involvement in Harper and Tolliver's life. While also revealing some very shocking and bizarre secrets about their family's harsh past. I also love how Charlaine Harris can introduce the reader to seemingly simple heroines that are really extraordinary and very resourceful. She did it first with Sookie, and she's done it again with Harper. This series is another winner! I can't wait to read more.